Animal migration is one of the most striking and dramatic of all phenomena in the natural world, from great flocks of snow geese flying over North America to massive herds of wildebeest thundering across East Africa. More subtle but just as timeless a seasonal mass movement is the migration of many ungulates (hooved mammals like deer, elk, and pronghorns) across our rugged, mountainous western landscapes. Here in Central Oregon, native mule deer (Odocoileus hemionus) complete spring and fall migrations between their ancestral summer and winter ranges, as they have for thousands of years. With more and more development in our rural areas, mule deer are being displaced from their inherited routes, leading to unhealthy populations. That is why we continue to defend protections for wildlife habitat throughout Central Oregon. Young deer learn the well-worn pathways from more experienced animals through what ethologists refer to as social learning or cultural transmission. In the fall, “muleys” move in a sheet-like pattern along a braided network of trails across the landscape from higher to lower elevations to arrive on their vital winter range where the snow is not as deep and forage is more available. 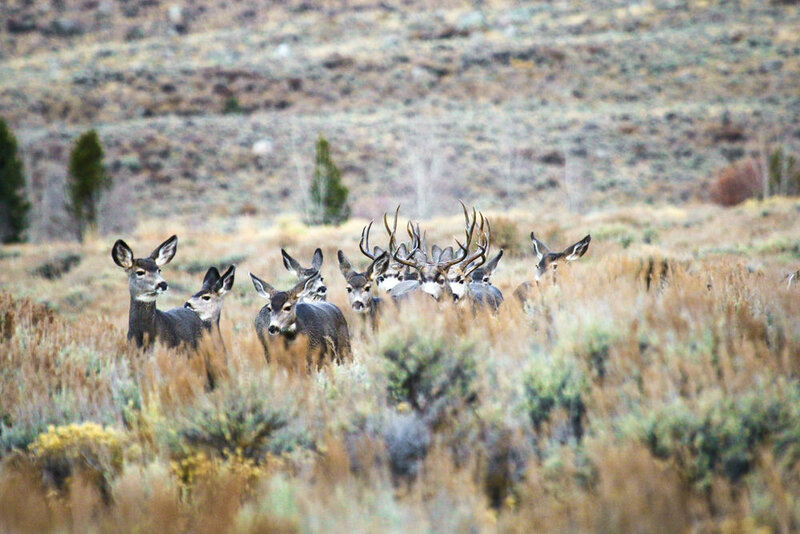 The mule deer population in Central Oregon has sadly been in decline for some years. They face ever increasing habitat loss, fragmentation, and degradation from rural development as well as impacts from people, dogs, and vehicles. On the winter range, they typically live on the edge of starvation, and any added expenditure of energy or stress caused from human activity increases their mortality and decreases their fecundity. And migrating deer face an imposing array of barriers like fences, roads, and increasing traffic. Mule deer need the critically important protections afforded by rural land use regulations, mitigation of barriers to movement like safe passage over or under highways, and more careful consideration of human impacts, particularly during migration and seasons when they are more sensitive to disruptive stress. Now more than ever, we need your support to to uphold protections for wildlife habitat, farm and ranch land, and smart planning in this beautiful place we call home. Please help us protect these incredible animals and the forests and ecosystems we share with them by becoming a member today. Newer PostWhat can we learn from California's devastating wildfires?